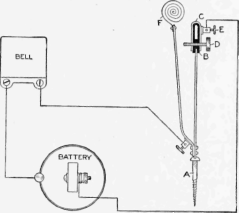 A unique electric fishing signal, which may be rigged up on a wharf or pier, and the electric circuit so arranged as to operate an electric bell or buzzer, located in the fisherman's cottage, or any other convenient place, may be constructed as follows: Obtain two pieces of 1/16-in. spring brass, one 6 in. long and 3/4 in. wide, and the other 7 in. long and 1/2 in. wide. Mount a 2-in. brass wood screw, A, in one end of the 6-in. piece as shown. Place over the end of the 6-in. piece a thin sheet of insulating fiber, B, allowing it to extend down on each side about 1 in. Then bend a piece of 1/16-brass, C, over the insulating fiber, allowing it to extend down on each side the same distance as the insulating fiber. Drill a small hole through the lower ends of the U-shaped piece of brass, C, the insulation, B, and the 6-in. piece, while they are all in place. Remove the insulation and the U-shaped brass piece, and tap the holes in the brass for a machine screw, D. Enlarge the hole in the 6-in piece, and provide an insulating bushing for it with an opening of the same diameter as the brass machine screw. Mount a small binding post, E, on one side of the U-shaped piece of brass, and the parts may then be put together and held in place by means of the brass screw. Drill two holes in the other end of the 6-in piece, also two holes in one end of the 7-in piece, and rivet them together with two small rivets. The 7-in. piece should project beyond the end of the 6-in. piece. A piece of thin spring brass should be made into the form of a spiral, F, and fastened to the upper end of the 7-in. piece. Provision should be made for attaching the fishline to the inside end of the brass spiral. A small binding post should be soldered to either the 6-in. or 7-in. piece, at the bottom. If the device is set up with the head of the brass adjusting screw in the top of the 6-in. piece, pointing in the direction the line to the fishing hook is to run, and if a fish pulls upon the line, the 7-in. piece is pulled over and touches the point of the adjusting screw. If a battery and bell, or buzzer, is connected as shown, the circuit will be completed when the 7-in. piece comes in contact with the adjusting screw, and the bell will ring.